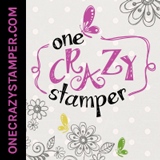 Lora's Crazystamper Blog: Vintage Bliss! Well this image is right out of my creative element. Vintage & ornate are certainly not my usual picks for stamps but I love this image from IndigoBlu called Clematis Flourish. I coloured this with Copics & added a sentiment from Just Rite. Hope you have a wonderful day & thanks for stopping by!